News and updates about our working group will take place in Linkedin where our group has reached more than 100 followers. Our workshop in MIE 2011 Oslo was a very interesting one, mainly by the value added by around 30 attendees. They were coming from clinical practice, research, students, etc. We have also people coming from many different countries, showing social media is a global phenomena. Among others I can recall people participating from New Zeeland, UK, USA, Japan, Germany, Norway, Switzerland, Greece, Finland, Zimbabwe, etc. Peter Murray (@peterjmurray) made the introduction of the workshop and provided a very nice overview of all the activities of our working group. He also was very active taking notes of all the comments from the audience. Most of this blog post is based on his notes. Chris Paton (@ DrChrisPaton ) introduced his experience on using social media to improve interaction with students. He explained the role of social computing applications and not just Web 2.0. For example, Wikipedia can be a great example of social computing application where there are already more than 3.5 million articles created by millions of volunteers. Another aspect addressed by Chris Paton was usability. User friendly website have higher chances to success. However, there are cases where websites with poor usability can be a huge success (e.g, Criaglist). However, the complexity of social media makes nearly impossible to predict what will be successful. Chris also mentioned that social media is more than content. Content is social media platforms increase its value by the amount of users. The value goes up as more users come on board and create more value. In the healthcare domain an interesting development is the combination of Web 2.0 and data collection. He explained the case of PatientsLikeMe where users are not just sharing information in traditional forum but also structured data, also within patient-led experiments. Another example was the application TuAnalyze run in collaboration between the online community TuDiabetes and the Harvard Medical School. 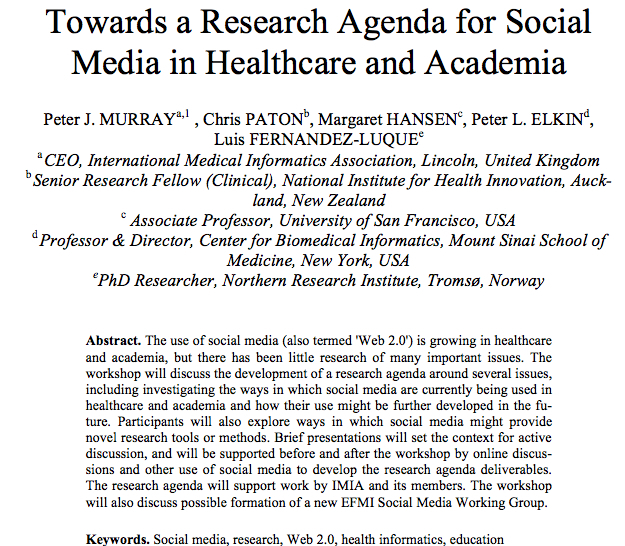 Margaret (@m2hansen) is a leader in the use of social media for nursing education and she enligthed the audience with many of her experiences using these new technologies to enhance the education of professionals and more recently also with patients. Already in 2005, they introduced satisfactory blogging as a vehicle for the education of clinical and nursing students. They have been also using wiki technology in education. She showed some examples of how they have used WikiEducator to setup courses. More recently she has been exploring the use of mHealth for education. For example, her students have been testing the use of iPod and videos for learning nursing techniques. The results of these experiences are quite positive and support the idea that those technologies can enhance education. She also showed how medical apps in the iPad could be used for medical education. Peter L. Ekin was not able to travel to Oslo. However, his topic human factors and health social media was also addressed in the workshop. 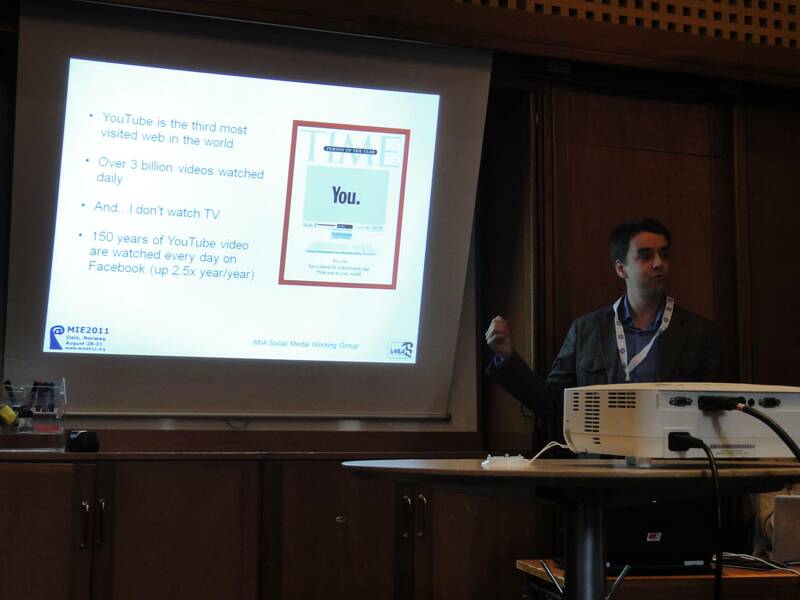 Luis Luque (@luisluque): I focused in the use of video sharing platforms (such as YouTube) in the health domain. First of all, I explained that videos are becoming extremely important in the new Web 2.0. In fact, YouTube is the 3rd most visit website in nearly all the world. Most of those videos are shared in social networks among friends and relatives. I showed many examples of videos for health promotion (e.g, The Big Blue Test, and channels created by health authorities (e.g, NHSCoices). Since not everything is good in YouTube I also showed examples of videos promoting un-healthy lifestyles (pro-anorexia videos) and I explained how difficult is to find good videos in YouTube without finding disturbing content (e.g, amputations). When is a problem a societal issues and not just an Internet Issue? For example, some non-healthcare professionals like to watch anatomical demos both offline and online. Open access within academic publications is putting the burden of cost on the authors, closing the door to many good researchers from developing countries. Despite the possibilities of Social Media we use sparingly these tools to upgrade the quality of research articles. Could we improve the situation using tools such as Wikipedia? What is success in social media? Can be low quality more popular than high quality? Should we take into account traditional quality or just hits? There were many other topics discussed in the workshop that are not addressed in this blog post.